So, it turns out that when Apple says its iTunes 8.2.1 update “addresses an issue with verifying Apple devices,” what it really means is that Apple's drawn up a list of which devices are allowed to sync and which aren't—and the Palm Pre is public enemy number one on the latter. 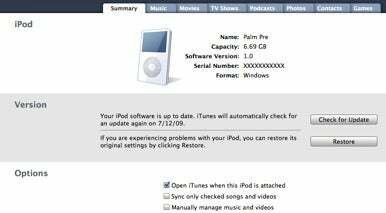 Back in May, before the Pre was officially released, Palm executives announced that the device would be able to sync with iTunes, pulling down your music, podcasts, and videos. The trick? As far as iTunes was concerned, the Palm Pre was an iPod. A screen that Palm Pre owners won't be seeing any time soon. While the media sync worked pretty well in our tests, the dark cloud hanging over the matter was whether or not Apple would move to disable it. But Palm seemed confident enough in its decision to ship the Pre and tout sync as a feature, never mind that just last month Apple fired a warning shot across Palm’s bow in the form of a knowledge base article about unsupported third-party digital media players. With iTunes 8.2.1, Apple has put a stop to the Palm Pre’s little masquerade, a move confirmed by the company in a statement to Dow Jones Newswires. The question now: what happens to Pre users? Also speaking to Dow Jones, a Palm spokesperson seemed to suggest that not upgrading iTunes is a good solution—but it seems unlikely most users will be willing to do that, especially over the long term as Apple adds more iTunes features. The Pre also works as a USB drive, so it’s possible to just copy songs over manually, though it can be a laborious process. There’s also the option of third-party syncing software, such as Mark/Space’s The Missing Sync for Palm Pre, doubleTwist, and the forthcoming Salling Media Sync 1.1, which is currently in beta. It really shouldn’t shock anybody that Apple would move to stop the Pre from syncing—after all, the ease and simplicity of the iTunes and iPod combination is part of what makes Apple's products so attractive. Palm’s making noise about this hurting Apple’s own customers, but I’d guess that Apple is probably not too concerned with that subset of its clientele, which is pretty slim at the moment. Should the Pre user segment start to grow, who knows? Apple supported third-party media players once; if it benefits Apple, then the company might decide to once again do so.